Congratulating a man on his promotion may call for some slaps on the back and brews after work, but the best way to welcome him to that corner office on the first day is a vase full of anthuriums. These tall, tropical flowers, sometimes called Flamingo Lilies, have a certain stateliness to them and a rather masculine appearance that makes them appropriate for tough guys and softies alike. While the bright red variety gives off a sense of power, the meaning of this bloom in the language of flowers symbolizes hospitality. A vase or potted container full of anthuriums sends the message that he’s the guy in charge, but the door is always open. 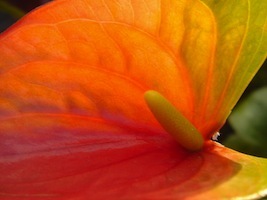 Native to the New World, the anthurium was first identified in parts of Mexico and the Caribbean. Diverse and widespread around the Americas, there are several hundred different species that range in size, shape and color. The one most typically available at flower shops and garden centers have a red or green spade-shaped, brightly-colored, upright “petal,” which is actually a botanical adaptation called a bract. This bract is more like a leaf than a petal and stays turgid and colorful for several weeks. It can come in orange, yellow, pink, white or green. The actual “flower” is a type called a spadix, which is a densely spiraled appendage that sticks straight up from the bract. The image this flower exudes is that of, ahem, virility and masculine prowess; perfect for pumping him up the first few days on the new job! One of the advantages in choosing this flower to celebrate a promotion is that it can be bought as a cut flower in a vase or arrangement, but is also sold as a houseplant. 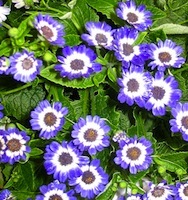 Needing very little care other than good soil, regular watering and medium to bright light, this little guy will thrive and grow to heights of 1-3 feet in a container with good drainage. What better way to celebrate the move from a dark cubicle to an office with a view than to give him a plant to put there! Rather than lasting a few weeks, this potted plant will grow and develop along with him. Evolutionarily, the anthurium is a complex plant. Part of the aroid family, this unique bloom evolved recently and has one of the strangest flowering morphologies of any plant on Earth. Many plants in this family are thermogenic, meaning they are able to produce their own heat. Quite possibly, this developed to attract pollinators through the heating and releasing of pheromones and some of them can reach temperatures of over 100F, which will make your guy seem cool under pressure in comparison.